-- Bid on a limited edition Al Hirschfeld print of Bernadette Peters as Annie Oakley in the 1999 Broadway Revival of "Annie Get Your Gun." Proceeds benefit Broadway Barks. 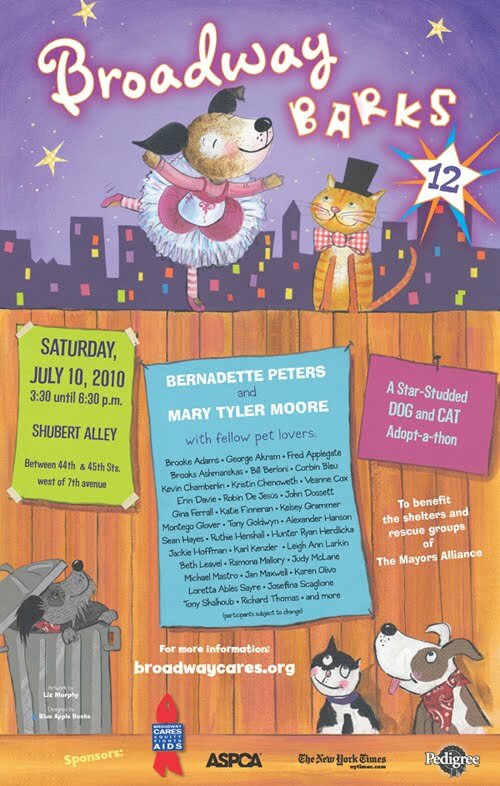 -- And speaking of Broadway Barks, on Saturday, July 10, Kristin Chenoweth, Kelsey Grammer and Sean Hayes will be among the many stars joining founders and cohosts Mary Tyler Moore and Bernadette Peters for the 12th annual edition of Broadway Barks, the all-star dog and cat adopt-a-thon featuring more of your favorite celebrities presenting adorable, but temporarily down-on-their-luck, dogs and cats from more than 25 New York area shelters and rescue organizations. -- Even more Broadway Barks news! A Little Night Music's Hunter Ryan Herdlicka appeared on WPIX's morning show to talk about Broadway Barks 12. -- Did you know you can get lots of theatre discounts by joining WNET's Kids Club 13? Save money at The Gazillion Bubble Show, Manhattan Children's Theatre, The Shadow Box Theatre, Shakespeare Theatre of New Jersey, TADA! Youth Theatre, and more. -- There's just a little time left to join the New York Neo-Futurists Basic Training Level I Workshop. -- Redd Tale Theatre Company dives into its seventh season with Shakespeare's classic, Macbeth, and a new adaptation of the French classic The Triumph of Love by Will Le Vasseur. Both are directed by Artistic Director, Will Le Vasseur.